Car Insurance companies have used risk-based pricing for a long time. In simple terms, the idea is to charge a higher insurance from cars that are more likely to get into an accident and a lower insurance for cars that are less likely to get into an accident. In the US, for instance, if you are under 25, single and drive a sports car, you are considered a higher risk customer than someone who is, say, 30, married and drives an SUV. And if by chance, your sports car is red in color, then you are even more likely to get into an accident. In this case, your insurance premium is going to be sky-high. So how do companies decide who is risky and who is not? How do insurance companies infer that a red sports car is more likely to get into an accident than a silver sports car? This is where analytics comes in. Insurance companies have historical data on hundreds of thousands of cars. They have data on which car filed for an insurance claim (which implies which car got into an accident). They also have other information pertaining to the cars, for example their vintage, location, prior history etc. In India, the insurance is for the car and not the driver. This means that insurance companies do not consider factors like the age of the driver, her previous record etc. when it comes to insurance pricing. Only car related factors like the vintage, location etc. are taken into account. Let us assume a simplistic scenario where we have 2 factors – the car model and the location. And we want to do build a differential pricing strategy based on these 2 factors. Let us understand this intuitively first. Location: Take the location first. Is location a factor that affects risk in this case? Differently put, is a car more likely to get into an accident in a city like Delhi versus a city like Indore? Now Delhi has more than 100 times the vehicles in Indore. It is therefore possible that accident rates in Delhi are higher than Indore. And thus, a car bought in Delhi could be more likely to get into an accident than a car bought in Indore. Model: Similarly, the car model. Is a Hyndai Santro less likely to get into an accident than a Tata Indica? Maybe. Without data, we really can’t tell. So let’s look at some data now. We have historical data on 41096 policies. The policies cover 12 different car models and sixteen locations. We first examine the data by car model. 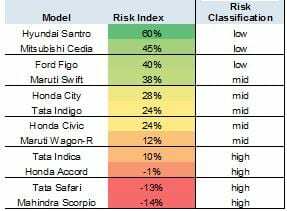 We rank order the car models based on their risk index. The risk index is calculated on the basis of the receivable (i.e. policy premium) and expected outflow (claim payout). Similarly, we also analyse the data by location. Our data tells us that Scorpio and Safari have the highest risk associated with them. 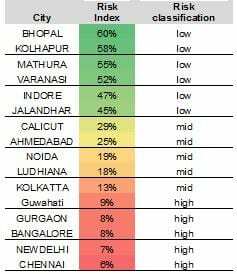 Similarly, Chennai and Delhi are the cities with the highest chance of getting into an accident. We can now take this one step further and create a matrix of city by model. We can simplify this matrix by classifying all models and locations into a 3*3 grid. 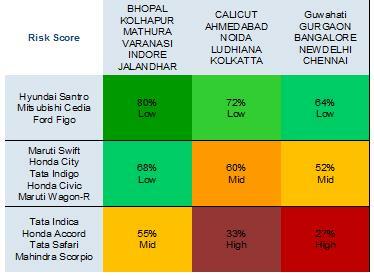 The grid tells us that based on historical data a Tata Indica in Delhi will be a lot riskier than a Hyundai Santro in Bhopal. Thus, a risk based pricing will lead to a higher insurance premium for someone who buys an Indica in Delhi than someone who buys a Santro in Bhopal. Please note that this data is not representative of the Indian market. The data is for illustration purpose only. This risk model is valid only if the probability distribution of claims is inversely related with the ownership distribution. It may be possible that the model x has higher proportion of total ownership and hence higher proportions of claims. If the data is based on only claims and not on proportion of policies purchased it will not give a true picture. “I think that insurance policy of both India and US benefits the insurance companies. It’s just that US and India have a different way of analyzing, but the concept of risk based analyzing would work for both.